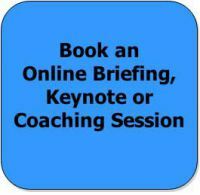 To book an on or in-person talk, briefing or coaching session get in touch. Paul Levy has been working in the realm of digital working for over ten years. He is author of the book “Digital Inferno” and co-author or the book “Technosophy“. You can book Paul for an on or offline talk, briefing or workshop. Paul has designed and co-hosted, facilitated and given advice to hundreds of meetings in the digital realm, in the private and public sector, in the arts and in industry, all over the world. He’s facilitated online conferences, decision-making meetings, problem solving teams, live broadcasts and even online open space and improvisation sessions. If you’d like book Paul for a virtual or face to face event, you are invited to get in touch. Apple – Genuinely Happy 40th Birthday or Looming Mid-life Crisis?